For 11-year-old Kobe, life wasn’t supposed to take such the dramatic turn it did, after his owner surrendered him to the high kill Carson Animal Shelter in Gardena, California. Carson, the last place one would expect to pin their hopes and dreams, is not the ideal situation for any dog, or cat to live, ever. 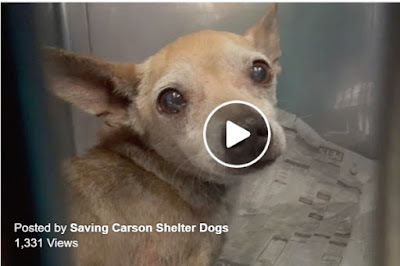 That’s because Carson gives the dogs and cats living the facility just a few weeks, and in certain instances just days to find forever families, before the unthinkable happens: euthanasia. Kobe, who has been in the shelter for less than a week, seems to know all about what could possibly happen if he doesn’t find a home and quick. The depressed senior pup was surrendered to Carson because his owner said he was getting “a bit too old,” and that the “medical bills” were piling up for the sweet tempered, loyal pup. Sad indeed. Fidonation, if you or someone you know is interested in giving this precious pup the forever family he rightfully deserves, please contact the Carson Animal Shelter at 310-523-9566 and reference the shelter ID #A3601950. Additionally, please share this story on Facebook or Twitter so we are closer to finding Kobe a home. Additionally, please share this story on Facebook or Twitter so we are closer to finding Kobe a home.